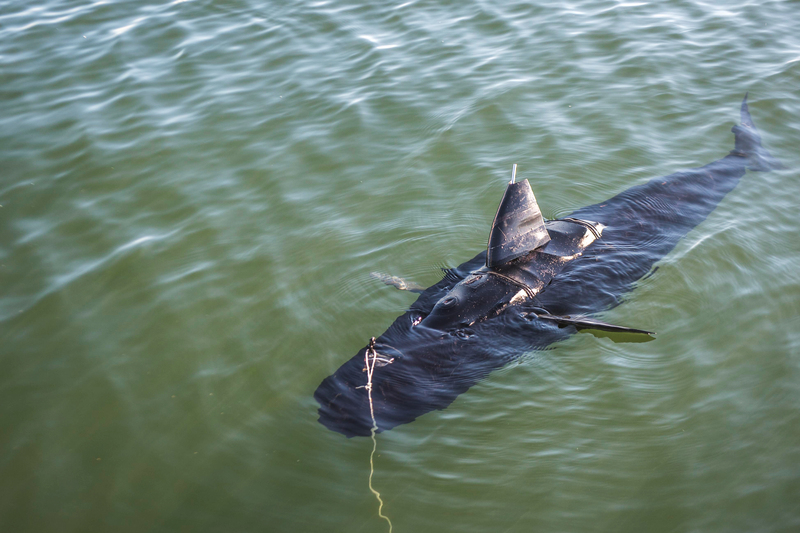 The US Navy and Boston Engineering created a new underwater drone called the GhostSwimmer, a reconnaissance drone that looks just like a shark. GhostSwimmer measures five feet in length, weighs around 100 pounds, and can "swim" in water from 10 inches to 300 feet in depth. The UUV can operate while tethered or swim independently, with personnel controlling it using joysticks. "GhostSwimmer will allow the Navy to have success during more types of missions while keeping divers and sailors safe," said Michael Rufo, Boston Engineering Advanced System Group director, in a press statement. The US Navy has boosted efforts to create a fleet of unmanned underwater vehicles (UUVs) it can use or reconnaissance, security - and one day help launch stealth attacks - against select targets. There is increased research into robotics and drone development based on natural movement of wild animals.